I Am Obsessed With Cheese! One of my best friends Barrie-Lynn is the famous Cheese Impressario. She is so fabulous that I introduced her to my buddies DJ Paul and Juicy J from Three 6 Mafia (they won the Academy Award for that song, “It’s Hard Out There For A Pimp”) and they hired her to be their official cheese consultant. She’s hosted parties for many other famous Oscar-winners and she has also hosted parties for me at Castle Ivar (aka DIVA Headquarters). This was a Scotch and Cheese Tasting that we had the week before Christmas. Making a fabulous cheese plate doesn’t have to be a big production. You don’t even have to be an expert in cheese. 1. Go to a cheese store. I like The Artisan Cheese Gallery in Studio City because it’s near my home and I have known the owner Melody since she opened it. However, there are cheese kiosks at Trader Joes, Whole Foods and other markets all over the country. If you are in Manhattan, it’s as simple as going to Dean and Deluca’s. 2. Select three cheeses. I always get a hard cheese (I like Manchego because it goes with everything), a soft cheese (I like Brie, but there are all sorts of soft brie-like cheeses to discover that aren’t as pricey) and a Blue Cheese. There are so many types of cheeses from different farms, regions and animals (cow, goat, sheep) in each of these categories that you should sample and discover what you like. 3. Select bread and/or crackers. The easiest thing to do is buy a box of crackers. Carrs water crackers aren’t ideal but will do if you live in an area where there aren’t gourmet stores with fancy crackers. I like to use get one of those long French baguettes and slice it up instead of crackers. 4. Get dried fruits and nuts accouterments to go with it. My favorite fruits to serve with cheese are dried figs, strawberries and apricots. My favorite nuts are candied walnuts. I also serve honey on the side in a pretty dish with a little honey drizzler for guests to drizzle honey on their cheese. If you haven’t tried honey and cheese, you don’t know what you are missing. 5. Assemble The Cheese Plate. 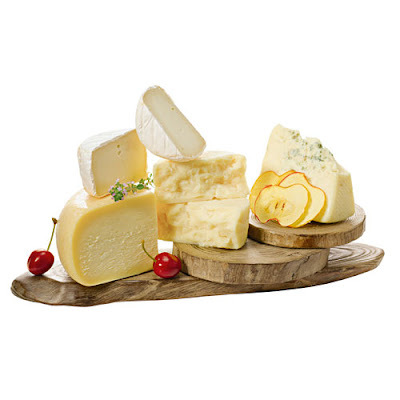 I use a cheese board or a round plate and put the three cheese wedges down in a circle, like they are pieces of a pie. I leave space on the sides of the cheese slices for the fruits and nuts.